Thursday brought back memories for me of standing in front of a blackboard!!! Many of you will know I taught for most of my working life and my handwriting has not improved since those times, as many of our ladies will testify!! Why were we all sitting there waiting in anticipation? 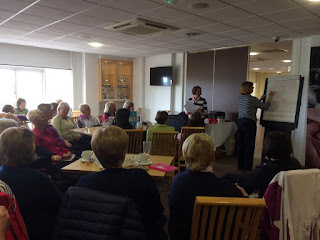 Well, Thursday after golf brought many Oohhs and Aahhs as the draw for the Summer KOs (Ann Grist and Mary Warmoth Trophies) took place. The official draws are now on the noticeboard in the locker room for you all to review, along with an explanation of the 'Rules of Combat' for those new to these competitions!!! The date for the first round of both Trophies is a way off (June 30th), but it doesn't mean you can't get started and play your first match as soon as you both wish. The weather has been more Spring like, this week, I think you will all agree, which was lovely to see. On Tuesday many ladies 'Picked their Poison' as the format was called selecting their 9 best holes to score from. Second place was held by four ladies (Kathy D, Lauren, Jan K and Katy C) but coming out on top was Julie R. A big well done to her and as always to Hazel and Katy for finding such interesting formats to play!! Before the 'Blackboard Gathering' on Thursday, we had all gone out to play in the O'Sullivan Cup (Stableford Alliance). It is always great to play in a team game, with the pressure off at least slightly! The results of that Trophy will be announced at the Spring Meeting, so we will hold you in suspense for a while yet. Saturday saw another lovely day, this time for the Ken Bird Final Individual Stableford. Linda B made the most of it, coming in 6th out of a field of nearly 100 players with 37 pts. What a brilliant result Linda, well done !!!! (Psst, hopefully she gets her handicap cut before Pauline and I have to play her in the knockouts!!). Lin has asked me to remind you all that if you wish to pull your name from a HowDidiDo competition within a few days of it being played, please contact her first as she will do this for you and at the same time be able to slot someone in, who is on the waiting list. The competitions in the next few weeks have received great sign-up numbers and we are thrilled so many of you are wishing to get out to play. As always if there are no spaces available on the system, please email Lin and she will find a slot for you, if at all possible. Many of you are signed up for the Captains Drive-In and that's brilliant to see so many of you coming along, I will certainly need all the support I can get!! There are still a few spaces left though. Can I remind you to add your food selection if you have not already done it, as this will obviously help with catering. As you will be aware, Vicky T and Rogie won their first round match of the Daily Mail Foursomes against Heydon Grange recently, their 2nd round draw will again be at home, this time against Knebworth, date still to be organised. Good luck to them. Kathy D and Pat W are representing the Ladies Section in the Powell Cup this year. They have been given a Bye in the first round so they wait to see their 2nd round draw at the end of April. Tomorrow, Monday 25th, our Pearson team of Kathy C, Linda B, Nikki B, Pauline H, Rogie T, Nicola A and Lin go off to play at Manor of Groves, near Sawbridgeworth. Good luck to all of them, I'm sure they will play their socks off!! Get out there and enjoy the weather this week!